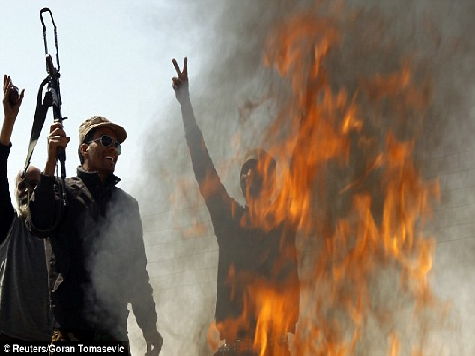 Islamists around the world are setting their countries on fire. Tunisia: In Tunis, Islamist protesters jumped over the wall of the U.S. Embasy compound, broke windows and set fire to trees; police fired tear gas at the protestors in order to stop them. 2 protestors have been killed, and 29 have been wounded. An American school has been set on fire. The black flag of Al Qaeda now flies over the US embassy. Sudan: Gunfire was heard at the U.S. Embassy. The German Embassy in Khartoum was invaded; 5000 protestors had circled the embassy as well as a nearby British mission. When the Islamists forced their way into the German Embassy, policemen simply stood aside. Lebanon: One person was killed and two wounded when security forces fired on protesters in the northern city of Tripoli and a KFC was burned. Yemen: Marines have been sent to the U.S. Embassy to ward off attacks. London: 200 protesters are burning USA and Israeli flags outside the US embassy in London. India: In Chennai, Muslim protesters burn a U.S. flag outside the U.S. Consulate-general. Egypt: The Egyptian Muslim Brotherhood actually called for a protest; protesters clashed with police in Cairo near the U.S. Embassy. Meanwhile, in the North Sinai, terrorists have broken into the Multinational Force & Observers (MFO). Four wounded are reported. Jerusalem: A demonstration was held near Damascus Gate in Jerusalem’s Old City. Crowds were also forming in Malaysia, Bangladesh and Iraq.